With Office Depot coupons and Office Depot coupon code discounts, such as the ones that we list on this page, you can save on things like office supplies, furniture, computers, electronics, and accessories. There is no need to pay full price if we have an Office Depot coupon code for you. You don’t have to be a rocket scientist to know that Office Depot has great deals on office supplies. But the tech lover will also appreciate their bargains on computers, servers, printers, copiers, faxes, data storage and media, cameras, camcorders, and computer accessories. And, of course, we techies can’t pursue our interests without a place to sit and work, so Office Depot stocks a full line of furniture from chairs, desks, workstations, and bookcases to file cabinets, shelves, lamps, carts, and stands. Office Depot was founded in 1986 by three partners who wanted to create a warehouse-like store where office supplies could be sold at deeply discounted prices, and it eventually grew to encompass over 1,000 stores nationwide. 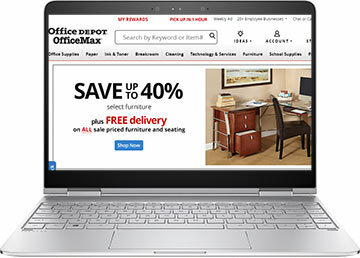 The online storefront of the company can be found at www.officedepot.com, which attracts millions of visitors each year. At officdepot.com, you’ll find everything you need for your office or home office, including paper, forms, ink, toner, ribbons, envelopes, pens, pencils, filing and storage products, and promotional products. You can shop for school supplies, AV Supplies and equipment (such as monitors and projectors), and supplies for the breakroom or mailroom. Save big with OfficeDepot brand products or get discounts on other trusted brands such as HP, Post-it, Bic, and New Leaf. Hop on over to the technology section for laptops, desktops, tablet PCs, notebooks, and servers from Asus, Acer, Lenovo, Compaq, CyberPower, Toshiba, Panasonic and other respected manufacturers. Geeks will be pleased with the wide selection of computer accessories from webcams, ergonomic keyboards, and speakers to power surge strips, cleaning tools, and laptop cases. When it comes to office machines, Office Depot boasts not just copiers, but also label makers, calculators, laminators, and cash registers. Peruse a selection of digital cameras from Sony, Kodak, Olympus, and Flip. This online store also offers its busy clientele copying, printing, and shipping services, and — not that a tech savvy person like you will need it — computer set up and repair. Computers4SURE used to be a technology superstore that sold tons of computer products at Computers4sure.com. These days it is part of the Tech Depot department, which is actually now the Business Solutions Division available at business.officedepot.com instead of techdepot.com.